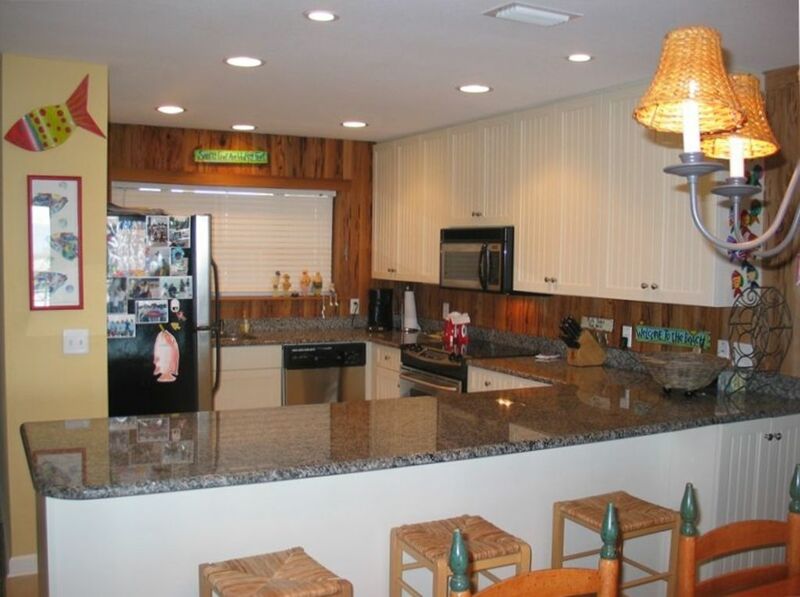 Beautifully decorated architect/ fisherman family owned beach front condo of 1162 square feet. Completely renovated after hurricane Ivan. Gorgeous landscaped grounds with free on site boat/trailer storage. Granite countertops, extremely well equipped kitchen with under counter ice machine, pecky cypress paneling, tile flooring in kitchen and living area, carpet in bedrooms. Ground floor unit with direct and easy access to beach and pool. Unit overlooks one end of a large pool. Easy to keep an eye on the kids at the pool or the tremendous grassy lawn, while still seeing the dunes and gulf. Parking directly in front of unit. Very uncrowded. Almost 900 foot wide beach serving 60 beachfront units of which only about 25 are rentals. Unit is very family friendly with bunk beds and a queen in the second bedroom. Well equipped kitchen. Property includes BBQ area, boat docks, fishing and observation dock on the Old River (bay) across the street. Click satellite view in the location tab. Very unique setup rarely found in a beach property. MUST BE 30 YEARS OLD MINIMUM TO RENT! We live in Birmingham, Alabama. I am an architect and my wife is a school teacher. We have two adult boys. We happily share our favorite things to do with you, especially regarding food and drink! I serve on the Board of Directors of the Condo Association. We treat this unit as our second home with family oriented decor and furnishings, not a sparse rental with a couple of palm tree pictures .Very kid and elderly friendly, close to pool and beach. Walk in from parking in front only 2 steps up! We have been coming to Needle Rush Point for over 20 years and have been Owners for 15 years. There's no other place like it around. Low rise, charming, lots of room and rarely crowded except for holiday weekends. We raised our 2 boys here fishing, crabbing, playing..... They are grown now and still love to come back every chance they get! A large number of our renters have been coming back for many years, some several times a year. We are usually very flexible with dates and check in check out times (except in the summer, which is strictly rented by the week from Friday to Friday). We are also very reachable by phone or email during your stay if you require assistance with anything or have an issue of some kind. 60 units on gulf side and 40 on the river side. There are only about 25 units that rent, so it is rarely crowded. If you fish bring your boat as you can dock for free while you are here and store your trailer in the boat yard. Fishing advice and tips freely dispersed! Access is by keyless entry, so no keys to hand off or keep up with. Everything about this condo was excellent. Our family has been coming to Needle Rush Point for many many years and this is easily one of the nicest condos in the bunch. All of the condos here are nice, but this one has all the extra attention to detail that is so nice to have! VERY well equipped (AN ICE MAKER! ), good communication from the owners, I couldn't ask for more. I was somewhat reluctant to write a good review because now I'm afraid others will book this unit when we return next year. Don't book this the week I'm here! Thank you for the nice review. We consider that you wishing to return is one of the best compliments we can receive. Having raised our kids there we really enjoy having families return again and again for the same enjoyment we experience. See you next year! Everything was perfect! The condo, as well as the entire complex, was well maintained and beautiful. We loved the decor of the condo and enjoyed being on the first floor with easy access to the pool and beach. Hoping to make this an annual vacation destination. Thanks for everything! Great spot for our family vacation. Everything was fantastic at this beachy condo until check out day. With having to wash and dry all sheets and towels it was a nuisance that the dryer didn’t work better. Dry times added more than an hour to our planned departure. We were lucky we washed some towels the night before which took 3 dry cycles. Other than this zero complaints! This is a very nice, well equipped place. Grounds are very well kept & really big pool. Great location too. Best spot on the Key! We've been going to the Perdido Key area for years and this is by far our favorite unit! As soon as you walk in the door it feels like home! We love the decor of this unit and it was very accommodating. One of my favorite things about this unit is the location. It's not too far from anything! Orange Beach is literally just over the bridge, and going to watch the Blue Angels is just a little drive. Great restaurants are nearby that are family friendly. The owner was very nice and helpful with any questions we had--even sending us a text while we were there to let us know the Blue Angels were going to fly over our beach so we wouldn't miss it! She really goes the extra mile to make your stay fabulous! We use a keyless entry. Upon receipt of rent you will be provided with a code to the entry door.